In computer networking, hacking is any technical effort to manipulate the normal behavior of network connections and connected systems. A hacker is any person engaged in hacking. The term "hacking" historically referred to constructive, clever technical work that was not necessarily related to computer systems. Today, however, hacking and hackers are most commonly associated with malicious programming attacks on the Internet and other networks. Malicious attacks on computer networks are officially known as cracking, while hacking truly applies only to activities having good intentions. Most non-technical people fail to make this distinction, however. Outside of academia, its extremely common to see the term "hack" misused and be applied to cracks as well. One who breaks security on a system. Coined ca. 1985 by hackers in defense against journalistic misuse of hacker (q.v., sense 8). An earlier attempt to establish ‘worm’ in this sense around 1981–82 on Usenet was largely a failure.Use of both these neologisms reflects a strong revulsion against the theft and vandalism perpetrated by cracking rings. While it is expected that any real hacker will have done some playful cracking and knows many of the basic techniques, anyone past larval stage is expected to have outgrown the desire to do so except for immediate, benign, practical reasons (for example, if it’s necessary to get around some security in order to get some work done).Thus, there is far less overlap between hackerdom and crackerdom than the mundane reader misled by sensationalistic journalism might expect. Crackers tend to gather in small, tight-knit,very secretive groups that have little overlap with the huge, open poly-culture this lexicon describes; though crackers often like to describe themselves as hackers, most true hackers consider them a separate and lower form of life. It’s clear that the term cracker is absolutely meant to be derogatory. One shouldn't take the tone too seriously though, as The Jargon File is done with a sense of humor, and the above is said with a smile. As we can see from the above, illegal or perhaps immoral activity is viewed with disdain by the “true hackers,” whomever they may be. It also makes reference to cracker being a possible intermediate step to hacker, perhaps something to be overcome. Hacking is getting "unauthorized" access to a computer system or a resource Ethical hacking involves getting authorized access to resources in order to test if that resource is vulnerable against attacks. The main difference between both the terms lies in the intent of the hacker. A hacker(cracker) breaks into a system or network to use the gathered information in a illegal way whereas an ethical hacker finds the loopholes in the security system only to strengthen it. An ethical hacker is a computer and network expert who attacks a security system on behalf of its owners, seeking vulnerabilities that a malicious hacker could exploit. To test a security system, ethical hackers use the same methods as their less principled counterparts, but report problems instead of taking advantage of them. 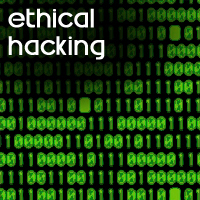 Ethical hacking is also known aspenetration testing, intrusion testing and red teaming. An ethical hacker is sometimes called a white hat, a term that comes from old Western movies, where the "good guy" wore a white hat and the "bad guy" wore a black hat.